Addicted to Rubber Stamping: Got Tools? How adorable is this image? Can you see why I love Doodle Pantry so much? This card was created using the Handy Birdie set from the May 2013 release. I used Laurie's pre-colored image because I've been dying to have a green bird, but haven't been able to color him correctly myself. But, why mess with perfection anyway, right? I also used one of her fabulous designer papers from the set, and the Got Tools? sentiment, as well. All of the individual pieces have been distressed with Chocolate Chip ink from Stampin' Up! The workshop apron is a cut file from Silhouette of America's online store. It started out life as a grilling apron, but I changed it up a little bit. I added the pocket on the front and then put some small metal tool charms that I had inside it. I also added a metal clip on the neck of the apron and 2 metal nailheads where the ties meet. The original cut file had the card squared off on the right side, so I hand-cut it to keep the shape in apron form. Love the apron - your skills are amazing with the computerized tools, I always enjoy going to your site to see what you have come up with. Great card. This is fabulous and one I'm keeping for my files for future CASING. I have an apron file I made plus I could buy this one and add some great tools like yours...case case case because I love love love! It makes a great workman's apron Susan, very nice! The charm tools are a perfect fit. Love it! That bird is so darn cute!!! Speaking of perfection....this is right there! That bird just makes you smile and the tools at the top are perfect...another winner Susan! Oh, what a great shaped card, Susan! Birdie is great and I love those tools you did! Susan, this is so dang cute! Love, love, your little apron cute card. And those little tool charms. Super clever, thanks for sharing. Susan, I too love Doodle Pantry and this little bird is just adorable. Love the apron shaped design. 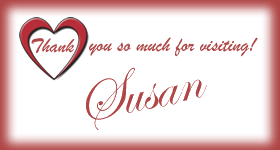 Absolutely wonderful Susan, love the apron card using that fabulous DP image, great job! Using the apron is so inspired! !